Google has announced that Cloud Firestore, its serverless NoSQL document database for mobile, web and IoT apps, is now generally available. Recently, Google announced the general availability of its Cloud Firestore NoSQL document database. In addition, the company is also introducing a few new features and bringing the service to 10 new regions. Cloud Firestore, a fully managed, cloud-native database is integrated both with the company's Google Cloud Platform (GCP) and its mobile development platform called Firebase. "Cloud Firestore does more than just core database tasks," Google wrote in a blog post "It’s designed to be a complete data backend that handles security and authorization, infrastructure, edge data storage, and synchronization. Identity and Access Management (IAM) and Firebase Auth are built in to help make sure your application and its data remain secure." 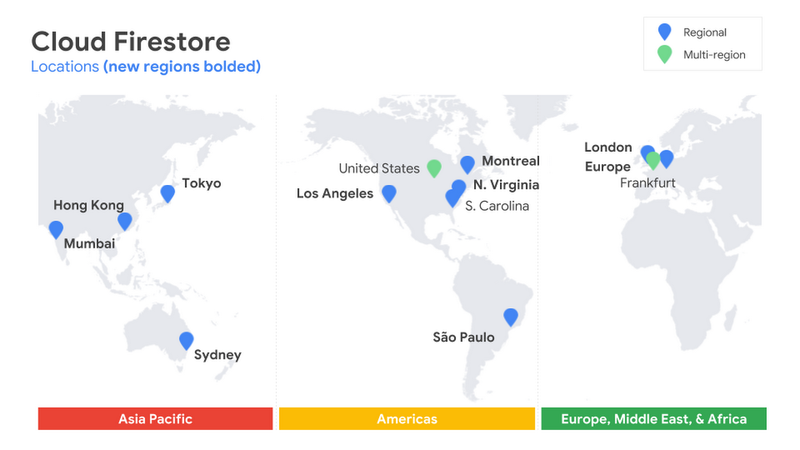 With this release, Google is giving users the option to run their databases in a single region. Earlier with the beta, developers had to use multi-region instances, and, though that obviously has some advantages with regard to resilience, but that's also more expensive and not every app needs to run in multiple regions. New regional instance pricing takes effect in March for most regional instances, and is as low as 50% of multi-region instance prices. Now you can take advantage of Cloud Firestore's SLA: 99.999% availability for multi-region instances and 99.99% availability for regional instances. This release also brings deeper integration with Stackdriver, the Google Cloud monitoring service, which can now monitor read, write, and delete operations in near-real time. The company also plans to add the ability to query documents across collections and increment database values without needing a transaction.